An extraordinary and controversial mood has developed around events that reportedly began late on the evening of Thursday, October 4th, 2001, at a Gundiah property near Tiaro, culminating in the early hours of Friday, October 5th, 2001, and then played out in the glare of rapidly escalating media coverage. Three people were directly involved in these alleged events. Keith Rylance (40), his wife Amy (22), and their business partner, Petra Heller (39) were on their property, which was being developed as “Whispering Winds” winery. Other potential activities were also being developed at the location. The following account comes from interviews conducted by us with them, along with primary source material such as TV interviews. Keith Rylance told us that he had gone to sleep in the caravan bedroom at about 9.30 pm. Petra retired to her bedroom in the caravan annex. Amy stayed on a couch watching TV in the caravan annex “lounge room”. Each of these locations were in close proximity, separated by a window and wall respectively from the lounge room. Petra’s room had a door leading to the lounge room, which was left ajar. The door to the bedroom, where Keith was, apparently was open to the lounge room. Amy apparently fell asleep on the couch. A storm was in the area. Around 11.15 pm, Petra was reportedly woken up and when she entered the adjacent lounge was confronted by an extraordinary sight, that allegedly quickly overwhelmed her. A rectangular beam of light was being projected through the open window of the caravan lounge room. This light beam appeared to be truncated at the end. Inside the beam Petra claims to have seen Amy in a sleep prone position, being carried out head first through the window. Underneath her, also within the beam were the items that had been on the coffee table adjacent to the couch Amy had been on. Before apparently fainting in shock Petra saw that the beam was coming from a disc shaped UFO hovering just above the ground a short distance away, near a tree at the rear of the clear section, immediately behind the annex caravan house. Petra reports she believes she was only in a faint for a very short period of time. Regaining consciousness, she began screaming. Keith reports that he was awoken by the commotion coming from Petra. As he came from the caravan bedroom and stepped down into the lounge room annex Keith claims he was confronted by the sight of a highly agitated Petra and the contents of the coffee table on the floor in front of the window. He told us that he soon realised that the window screen was torn in both a vertical fashion and along the bottom of the window frame. Keith indicated that initially he couldn’t get any sense out of Petra who was crying and very agitated, so he rushed outside trying to locate Amy. She was reportedly nowhere to be found. Keith states when he started to be less agitated himself he was eventually able to get from Petra an idea of what happened. Keith claims he initially refused to believe what Petra was telling him. He said he rushed outside again trying to find his wife. Eventually as the situation became clearer, Keith indicates he decided to call the police. Keith call the Tiaro police around 11.40 pm reporting that his wife had been abducted and imploring that the police should come out. The manning status at that time meant there were some delays in the police coming out, but about hour and a half after the initial call Senior Constable Robert Maragna from Tiaro and an officer from Maryborough arrived at the site. Initially police thought they might have been walking into a situation involving foul play, even perhaps a murder scene, but then the bizarre circumstances of the alleged events came into focus. 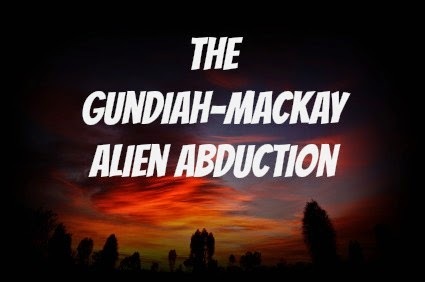 The two people, Keith and Petra, at the Gundiah property were claiming that Amy Rylance had been abducted by a “spaceship”! The officers were struggling to keep an open mind. They were joined later by Sgt. John Bosnjak, the officer in charge of the Tiaro police. He had been asleep when the police called him to assist in the investigation. The three officers continued their investigations at the site. They confirmed that Keith Rylance and Petra Heller appeared to be in an agitated state and that there was no sign of Amy Rylance. The torn screen was examined. A flowering bush, commonly known as “yesterday, today, tomorrow” was located immediately outside the left side of window, had indications of possibly being affected by heat or another mechanism along its right side. Oddly another flowering bush, a hibiscus, located immediately on the right hand side of the window area was not affected in the same way. The police took samples for possible later testing. While the police were at the property, a phone call came through, which was taken by Keith Rylance. A woman was calling from Mackay indicating that she had taken a somewhat distressed and apparently dehydrated young woman from a BP petrol service station on the northern outskirts of central Queensland city of Mackay, some 790 kilometres to the north of the Gundiah – Tiaro area. The young woman turned out to be Amy Rylance, and the female caller was ringing to advise that Amy was apparently all right and was at the Mackay hospital, where she had been examined by a doctor. Keith handed the phone to Snr. Constable Marangna. Given these extraordinary circumstances Mackay police were called in, making a total of three police stations involved in the investigation – Tiaro, n outskirts of central Queensland, Maryborough on the coast and Mackay is some 790 kilometres to the north of the Gundiah – Tiaro area. A statement was notarised by the Mackay police with a Justice Act acknowledgement, that required Amy to acknowledge that it was true to the best of her knowledge and belief, and that if it is admitted as evidence, that she may be liable to prosecution if she had indicated anything in it that she knew was false. This statement indicated that she last only recollected lying on the couch at the Gundiah property. She had no recollection of the events that Petra described, but claimed she then next remembered waking up lying on a bench in a strange rectangular room. Illumination came from the walls and the ceiling. She was alone. She indicated she called out and heard what seemed to be a male voice, asking her to be calm and that everything would be alright and that she would not be harmed. Soon an opening appeared in the wall and “a guy” about 6 feet tall walked into the room. The man appeared to be slender in build but in perfect proportion, covered head to foot in a full body suit. He had what seemed to be a black covering mask on his face, with a hole for his eyes, nose and mouth. He repeated his calming assurances. Amy felt she had been there a while. The guy told her they were returning her to a place not far from where they took her from, because the lights were wrong at the property and it wasn’t safe. She then indicates she found herself lying on the bed and falling asleep. The next thing she recollects is that she woke up on the ground with trees around her. She felt disorientated, could smell the ocean, and indicated she was not sure how long she tumbled through bushland, but seemingly it was for a long time, but she felt she wasn’t making much progress. She then came out onto a road that looked like a highway and saw a light from a petrol station. She walked into the station, where staff seeing her state, tried to off some assistance. She accepted some water, as she felt somewhat dehydrated. Initially she was not able to answer identifying questions, and didn’t know where she was. She was also asked if she had been drinking or was on drugs, to which she said no. Amy indicated she felt tired, sore, drained and lethargic. She asked a woman at the service station to take her to the hospital, as she didn’t know of where else to go. The woman and her friend took Amy to the hospital. Later Amy spoke with two police officers and also spoke with her husband Keith from the hospital. She then went to Mackay police station where she gave the statement of events. Amy also indicated that this sort of thing had never happened to her before, but when she was in 5th year school she had seen a large UFO surrounded by smaller objects. The police arranged to put Amy in a motel pending the arrival of her husband. He and Petra arrived during the day and indicated they spent considerable time with Amy discussing what happen. Extensive notes were apparently made and photographs were taken of a triangular arrangement of marks on her inner right thigh, marks on each heel and the growing out of her hair which she had dyed earlier in the week. Her hair had apparently started to show her former colour, suggestive that some considerable time had passed for her, apparently indicative of rather more than a few hours. Body hair had allegedly also become somewhat more pronounced that would otherwise would be apparent for the short time involved. Via an Newsagent’s a copy of the Australian Ufologist magazine was purchased, Keith, Petra and Amy started to learn more about UFOs. Keith Rylance contacted the Australian UFO Research Network office number mentioned in the magazine. Diane Harrison took the call Date: Fri, 5 Oct 2001 15:20 p.m and for the next hour or so listened to the story that Keith and Amy told. Petra was apparently sleeping at the time. Given the nature of the story, its complexity and the fact it apparently featured the alleged use of “solid light”, Diane decide to bring Bill Chalker into the investigation, making contact with him during the evening of Friday, October 5th. Paradoxically Bill was scheduled to talk at a Brisbane UFO conference on October 13th, and his topics included “solid light” cases and the application of science to alien abduction cases. Bill put a call through to them at the motel, securing permission to record the conversation. Once again Petra was not available to talk about her part in the alleged events. Keith Rylance went into considerable detail about the events, referring often to the notes they had apparently been compiling during the day. The details described covered the events Petra had witnessed, what Keith had experienced, and what Amy told them had happened to her during her experience. Finally Bill spoke with Amy, focusing mainly on the events before and after the claimed onboard experiences, because Keith had already gone into considerable detail about the latter. Bill discussed with Amy her general responses and her physical state and her current state of thought on her experiences. Keith Rylance seemed to what to control how both media and investigators would get involved. His desire to contact the media promptly drew from both Diane and Bill the suggestion that he should think very carefully about the possible ramifications of doing so. Keith seemed to feel that it was important to get the story out, as it would come out anyway and this way he could control the way it did. He was also trying to restrict the way the investigators could or should look into their experience. He claimed they didn’t need to proof the experience. While he didn’t directly witness the experiences he believed both Amy and Petra. Given the possible nature of the event, and that irrespective of the ultimate resolution of the affair, it seemed destined to be a big story, Diane and Bill decided undertake an investigation. They had been given an indication from Keith Rylance that the three would wait for the investigators to come to Mackay. The claimants were in no apparent hurry to return to Gundiah. They gave permission for Bill and Diane to visit the property on the way. Bill arrived in the Brisbane area on Tuesday afternoon, October 9th. Diane and Bill then travelled to Gundiah, arriving at the Whispering Winds winery property, just after 10 pm. Because of the lateness of the hour, we got the witnesses permission to stay there overnight and to conduct whatever investigation we needed to do. Keith had arranged for a neighbour to regularly check on the two pets left behind, namely a parrot and a kelpie dog. He indicated to us that it would be okay to let the dog off for a run, but warned us it was very friendly but inclined to jump all over people. We let the dog off at some point and observed its behaviour. At one point it did jump up on the window where the damaged screen was located. This gave some support to the possibility that at least some, if not all of the damage, could have been caused by the dog. Some of the damage on closer inspection seemed suggestive of possible dog damage. Our inspection of the plant damage also suggested possible prosaic causes, such as heat stress. A plant at the front of the house had similar damage and a healthy flowering bush of the same species that was at the window, was examined by us at Mount Basset lawn cemetery has similar damaged. A gardener there we spoke to indicated that the species often had random or more extensive damage of a heat stress nature from hot sunlight. The prosaic possibilities for both the screen and the plant damage are only suggestive at this point and further investigation is required. We undertook extensive investigations at the property and the area. Police were very helpful. Our investigation generated many issues and questions, which we feel need resolution, in order to assist interpretations of these events. Further extensive investigations were undertaken in Mackay, focusing in particular at the area where Amy Rylance returned. These included attempts to reconstruct the circumstances of Amy’s return, through onsite research. The BP petrol service station staff were spoken with and a surveillance video tape that may contain Amy’s visit there was provided to us by the station owner. This part of our investigation also generated many issues and questions that need resolution if we are to approach any measure of certainty about the real nature of the events alleged. Keith Rylance indicated to us he would be available to us when we got to Mackay, but it was made clear to us early on the first day of our investigations there that this wasn’t probably going to be the case. When we contacted the motel where they had been the night before, their third motel in Mackay, we learned they had apparently already checked out that morning. We left messages on their phone but didn’t hear from Keith until early on the afternoon of our second day, as we were leaving Mackay. In his mobile call, Keith apologised for not being available, but was indicating they had relocated to an unspecified location after having fled the area. The primary reason for this Keith indicated was that they claimed they had a kind of “men-in-black” experience. In this case Keith was reporting a pursuit of their vehicle by a high powered dark brown 4 wheel truck. The nature of this event apparently frightened Keith, Amy and Petra, prompting Keith to attempt to loose the vehicle and eventually leave the area. Before the completion of this preliminary report (14th October) we have heard from Keith again. We remain hopeful that they will get into more direct contact with us. Keith Rylance told us that he had gone to sleep in the trailer bedroom at about 9.30 pm. Petra retired to her bedroom trailer annex. Amy stayed on a couch watching TV in the "lounge room". Each of these locations were in close proximity, separated by a window and wall respectively from the lounge room. Petra's room had a door leading to the lounge room, which was left ajar. The door to the bedroom, where Keith was, apparently was open to the lounge room. Amy apparently fell asleep on the couch. A storm was in the area. Around 11.15 pm, Petra was reportedly woken up and when she entered the adjacent lounge was confronted by an extraordinary sight, that allegedly quickly overwhelmed her. A rectangular beam of light was being projected through the open window of the trailer lounge room. This light beam appeared to be truncated at the end. Inside the beam Petra claims to have seen Amy in a sleep prone position, being carried out head first through the window. Underneath her, also within the beam were the items that had been on the coffee table adjacent to the couch Amy had been on. Before apparently fainting in shock Petra saw that the beam was coming from a disc shaped UFO hovering just above the ground a short distance away, near a tree at the rear of the clear section, immediately behind the annex trailer house. Petra reports she believes she was only in a faint for a very short period of time. Regaining consciousness, she began screaming. Keith reports that he was awoken by the commotion coming from Petra. As he came from the bedroom and stepped down into the lounge room annex Keith claims he was confronted by the sight of a highly agitated Petra and the contents of the coffee table on the floor in front of the window. He told us that he soon realised that the window screen was torn in both a vertical fashion and along the bottom of the window frame. Keith indicated that initially he couldn't get any sense out of Petra who was crying and very agitated, so he rushed outside trying to locate Amy. She was reportedly nowhere to be found. Keith states when he started to be less agitated himself he was eventually able to get from Petra an idea of what happened. Keith claims he initially refused to believe what Petra was telling him. He said he rushed outside again trying to find his wife. Eventually as the situation became clearer, Keith indicates he decided to call the police. Keith call the Tiaro police around 11.40 pm reporting that his wife had been abducted and imploring that the police should come out. The manning status at that time meant there were some delays in the police coming out, but about hour and a half after the initial call Senior Constable Robert Maragna from Tiaro and an officer from Maryborough arrived at the site. Initially police thought they might have been walking into a situation involving foul play, even perhaps a murder scene, but then the bizarre circumstances of the alleged events came into focus. 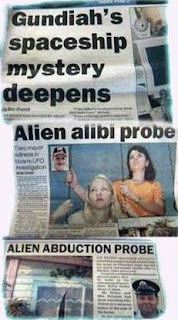 The two people, Keith and Petra, at the Gundiah property were claiming that Amy Rylance had been abducted by a "spaceship"! The officers were struggling to keep an open mind. They were joined later by Sgt. John Bosnjak, the officer in charge of the Tiaro police. He had been asleep when the police called him to assist in the investigation. The three officers continued their investigations at the site. They confirmed that Keith Rylance and Petra Heller appeared to be in an agitated state and that there was no sign of Amy Rylance. The torn screen was examined. A flowering bush, commonly known as "yesterday, today, tomorrow" was located immediately outside the left side of window, had indications of possibly being affected by heat or another mechanism along its right side. Oddly another flowering bush, a hibiscus, located immediately on the right hand side of the window area was not affected in the same way. The police took samples for possible later testing. While the police were at the property, a phone call came through, which was taken by Keith Rylance. A woman was calling from Mackay indicating that she had taken a somewhat distressed and apparently dehydrated young woman from a BP petrol service station on the northern outskirts of central Queensland city of Mackay, some 790 kilometres to the north of the Gundiah - Tiaro area. The young woman turned out to be Amy Rylance, and the female caller was ringing to advise that Amy was apparently all right and was at the Mackay hospital, where she had been examined by a doctor. Keith handed the phone to Snr. Constable Marangna. Given these extraordinary circumstances Mackay police were called in, making a total of three police stations involved in the investigation -Tiaro, on outskirts of central Qeensland, Maryborough on the coast and Mackay, some 790 kilometres to the north of the Gundiah - Tiaro area. A statement was notarised by the Mackay police with a Justice Act acknowledgement, that required Amy to acknowledge that she had stated was true to the best of her knowledge and belief, and that if it is admitted as evidence, that she may be liable to prosecution if she had indicated anything in it that she knew was false. This statement indicated that she last only recollected lying on the couch at the Gundiah property. She had no recollection of the events that Petra described, but claimed she then next remembered waking up lying on a bench in a strange rectangular room. Illumination came from the walls and the ceiling. She was alone. She indicated she called out and heard what seemed to be a male voice, asking her to be calm and that everything would be alright and that she would not be harmed. Soon an opening appeared in the wall and "a guy" about 6 feet tall walked into the room. The man appeared to be slender in build but in perfect proportion, covered head to foot in a full body suit. He had what seemed to be a black covering mask on his face, with a hole for his eyes, nose and mouth. He repeated his calming assurances. Amy felt she had been there a while. The guy told her they were returning her to a place not far from where they took her from, because the lights were wrong at the property and it wasn't safe. She then indicates she found herself lying on the bed and falling asleep. The next thing she recollects is that she woke up on the ground with trees around her. She felt disorientated, could smell the ocean, and indicated she was not sure how long she tumbled through bushland, but seemingly it was for a long time, but she felt she wasn't making much progress. She then came out onto a road that looked like a highway and saw a light from a petrol station. She walked into the station, where staff seeing her state, tried to offer some assistance. She accepted some water, as she felt somewhat dehydrated. Initially she was not able to answer identifying questions, and didn't know where she was. She was also asked if she had been drinking or was on drugs, to which she said no. Amy indicated she felt tired, sore, drained and lethargic. She asked a woman at the service station to take her to the hospital, as she didn't know of where else to go. The woman and her friend took Amy to the hospital. Later Amy spoke with two police officers and also spoke with her husband Keith from the hospital. She then went to Mackay police station where she gave the statement of events. Amy also indicated that this sort of thing had never happened to her before, but when she was in 5th year school she had seen a large UFO surrounded by smaller objects.